I have had the opportunity to operate a manual lawn-mower. If you’re a millennial, you might cringe at the word “manual” and probably don’t know what it’s like to use a manual mower. Well, long story short, it’s inefficient, exhaustive and inferior to using a motorized mower. Thanks to the march of technology, almost every landowner is now switching to a motorized mower, and can you really blame them? But the market is incredibly saturated these days, and if you don’t do your homework before buying one, you might end up with a rotten egg. But the one I’m featuring today is anything but a rotten egg. In fact, it’s one of the best mowers on the market! This is my review of the Ryobi RY48110 electric lawn mower, so let’s get started with its features. Ryobi Electric Riding Lawn Mower Review 2019: What did I like about it? That’s right, the Ryobi isn’t an archaic dinosaur from the past; it’s advanced and futuristic. Instead of utilizing a gas-guzzling, smoke-belching, constantly-breaking internal combustion engine, the Ryobi uses an electric powertrain to propel itself. It uses a 75 Ah lead-acid (no lithium-ion here, folks) battery (that’s 75,000 mAh for computer and mobile freaks) which gives the Ryobi a run-time of two hours (more on that later) or can trim two acres per charge. The power from that battery is transmitted via three noiseless and brushless motors (one for the drive and two for cutting), and that power is delivered at a voltage of 48 volts. The upshot of electrification is that there is no noise, there are no emissions, you don’t need to brim the tank repeatedly and maintenance is generally not required as there are no pistons, belts, cams, spark plugs, etc. Even if the need for maintenance arises, it is incredibly easy. You can charge the battery by plugging into any standard power outlet via the provided cord. Moreover, the mower can be used for retreats and resorts, where silence is of paramount importance. Maximum speed is 13 km/h when the blades are not engaged, 8 km/h if the blades are employed, and 3 km/h if in reverse. Despite the Ryobi’s best efforts to mimic a Tesla, it is still a lawnmower, and it has the tools for the purpose. It has a 38 inches cutting deck which is more than adequate for a mower of its size and capacity. The deck features two blades and can be adjusted in twelve different positions between 38 to 114 millimeters to ensure that you can trim your grass to the desired level. I found the trimming and mowing tools to be great, with the blades providing great consistency to the cutting process. Uneven patches and undulations were dealt with beautifully, no complaints here. After mowing, I proceeded to clean the deck which proved to be slightly problematic as it does not have a self-cleaning mechanism. Moreover, as most of the weight is concentrated down low, hence lifting the Ryobi would be cumbersome. But I guess the lack of this feature is justified at this price point, so the Ryobi is excused. 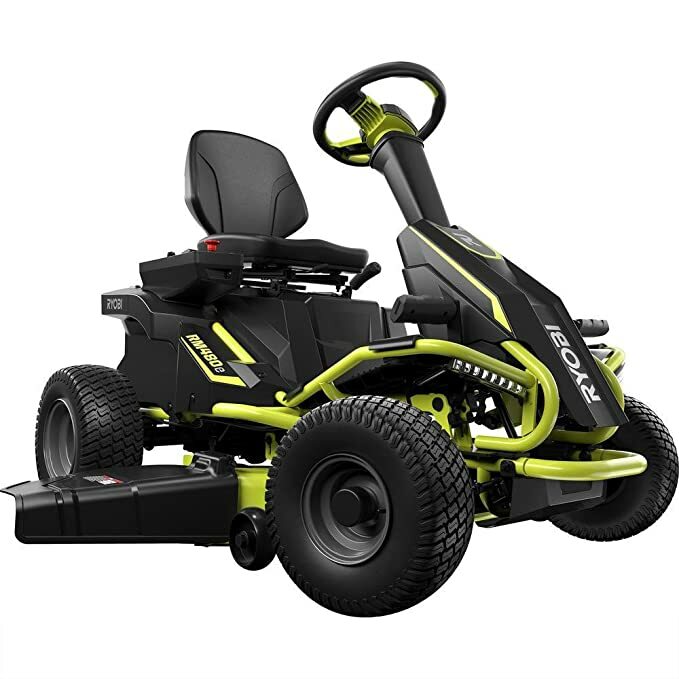 One of the most interesting things about the Ryobi RY48110 riding lawn mower is its chassis, something you will notice instantly if you’re a motorcycle maniac. The chassis is exposed and resembles the exoskeleton of an insect. The inspiration behind this could’ve been the Ariel Atom or most of KTM and Ducati’s lineup. I, for one, found it to be an absolute stunner, especially with its lime-acid green paint job. The Ryobi features two fairly standard control panels on either side of the operator. The switchgear feels sturdy and unlikely to break soon. The mower features cruise control as well which is useful for those long patches of land, and you can even charge your phone while mowing thanks to the built-in charger. As far as ergonomics go, the chair is placed pretty high and provides great cushioning and support, making the Ryobi ideal for protracted jobs. I would’ve liked the steering to be more angled towards me, but I guess I’m nitpicking. I found the lighting on the Ryobi excellent for mowing your lawn before the break of dawn. The two thin strips of LED lights do not seem like much, but they’re incredibly bright and do an excellent job of illuminating your path. As you would have guessed, poor battery backup is my biggest complaint with the Ryobi. The most you’ll ever get out of this machine is two hours of mowing in which, while it may be good for its class, does not stack up to gas-powered mowers. Granted, the battery does last for ten hours without the deck, but what’s the point of a mower if you aren’t going to use it for, well, mowing? And when the battery does run out, it takes at least six hours to charge. Until Ryobi makes something like Tesla’s supercharger, this is a potential deal-breaker. While the Ryobi’s seat may be comfortable, the Ryobi as a whole is not. It has no springs or dampers anywhere except under the seat, and they are not adequate. Considering the fact that lawns aren’t paved and metalled, Ryobi should’ve sprung the chassis to make the mowing process comfortable. The rideable lawnmower market is incredibly saturated these days. Finding a good mower is like finding a needle in a haystack. That’s why I’ve separated the wheat from the chaff and featured the Ryobi RY48110 riding lawn mower, which is an excellent mower and probably one of the best electric mowers on the market. The Ryobi will make light work of your lawn mowing jobs, and I highly recommend buying one.